, a very learned English bishop, was originally of Welsh extraction, being grandson of David Lloyd of Henblas, in the isle of Anglesey. 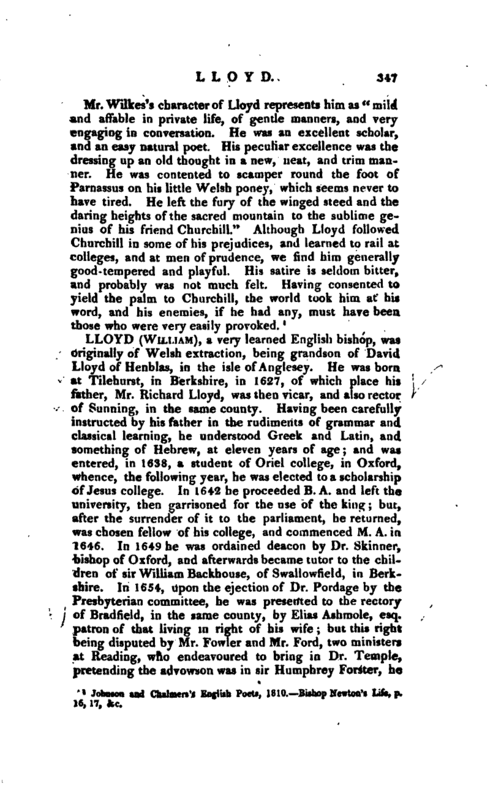 He was born at Tilehurst, in Berkshire, in 1627, of which place his father, Mr. Richard Lloyd, was then vicar, and also rector of Sunning, in the same county. Having been carefully instructed by his father in the rudiments of grammar and classical learning, he understood Greek and Latin, and something of Hebrew, at eleven years of age; and was entered, in 1638, a student of Oriel college, in Oxford, whence, the following year, he was elected to a scholarship of Jesus college. In 1642 he proceeded B. A. and left the university, then garrisoned for the use of the king; but, after the surrender of it to the parliament, he returned, was chosen fellow of his college, and commenced M. A. in 1646. In 1649 he was ordained deacon by Dr. Skinner, bishop of Oxford, and afterwards became tutor to the children of sir William Backhouse, of Swallowfield, in Berkshire. In 1654, upon the ejection of Dr. Pordage by the Presbyterian committee, he was presented to the rectory of Bradfield, in the same county, by Elias Ashmole, esq. patron of that living in right of his wife; but this right being disputed by Mr. Fowler and Mr. Ford, two ministers at Reading, who endeavoured to bring in Dr. Temple, pretending the advowson was in sir Humphrey Forster, he | chose to resign his presentation to Mr. Ashmole, rather than involve himself in a contest. In 1656 he was ordained priest hy Dr. Brownrig, bishop of Exeter, and the same year went to Wadham college, in Oxford, as governor to John Backhouse, esq. a gentleman-commoner, with whom he continued till 1659. 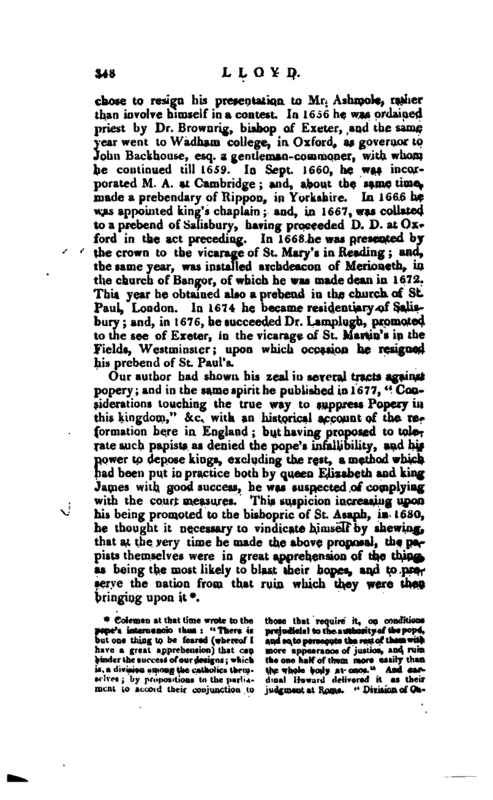 In Sept. 1660, he was incor* porated M. A. at Cambridge; and, about the same time, made a prebendary of Rippon, in Yorkshire. In 1666 he was appointed king’s chaplain; and, in 1667, was collated to a prebend of Salisbury, having proceeded D. D. at Oxford in the act preceding. In 1668 he was presented by the crown to the vicarage of St. Mary’s in Reading; and, the same year, was installed archdeacon of Merioneth, in the church of Bangor, of which he was made dean in 1672. This year he obtained also a prebend in the church of St. Paul, London. In 1674 he became residentiary<of Salisbury; and, in 1676, he succeeded Dr. Lamplugh, promoted to the see of Exeter, in the vicarage of St. Martin’s in the Fields, Westminster; upon which occasion he resigned his prebend of St. Paul’s. Our author had shown his zeal in several tracts against popery; and in the same spirit he published in 1677, “Considerations touching the true way to suppress Popery in this kingdom,” &c. with an historical account of the reformation here in England; but having proposed to tolerate such papists as denied the pope’s infallibility, and his power to depose kings, excluding the rest, a method which had been put in practice both by queen Elizabeth and king James with good success, he was suspected of complying with the court measures. This suspicion increasing upon his being promoted to the bishopric of St. Asaph, in 1680, he thought it necessary to vindicate himself by shewing, that at the very time he made the above proposal, the papists themselves were in great apprehension of the thing, as being the most likely to blast their hopes, and to preserve the nation from that ruin which they were then bringing upon it*. * Coleman at that time wrote to the those that require it, on conditions pope’s internuncio thus: “There is prejudicial to the authority of the pope, but one thing to be feared (whereof! and so to persecute the rest of them with have a great apprehension) that ran more appearance of justice, and ruin hinder the success of our designs; which the one half of them more easily than is, a division among the catholics them- the whole body at once.” And carselves; by propositions to the parlia- dinal Howard delivered it as their ment to accord their conjunction to judgment at Rome. ‘ Division of | CaAll suspicion, however, of his principles vanished in James IPs reign, when the nation saw him one of the six prelates, who, with archbishop Sancroft, were committed to the Tower in June 1688, for resisting his majesty’s order to distribute and publish in all their churches the royal declaration for liberty of conscience; and about the end of the same year, having concurred heartily in therevolution, he was made lord almoner to king William III. In 1692 he was translated to the see of Litchfield and Coventry, and thence to Worcester in 1699. He continued in the office of lord almoner till 1702, when, together with his son, having too warmly interested himself in the election for the county of Worcester, a complaint was made to the House of Commons, and a resolution passed of addressing the queen “to remove William lord bishop of Worcester from being lord almoner to her majesty; and that Mr. Attorney General do prosecute Mr. Lloyd, the lord bishop of Worcester’s son, for his said offence, after his privilege as a member of the lower house of convocation is out.” In consequence of this vote, an address Was presented to the queen, with which her majesty complied, and dismissed the bishop from his office. virulent satire upon him on this ucea- Commons. | office.“Bishop Burnet speaks of our author with the greatest warmth of friendship, and in the highest style of panegyric. In reality he was indebted to Dr. Lloyd for a great part of his own fame, having undertaken his” His* tory of the Reformation“by his persuasion, and being furnished by him with a large share of the materials; he likewise revised every sheet of the whole work during the printing. 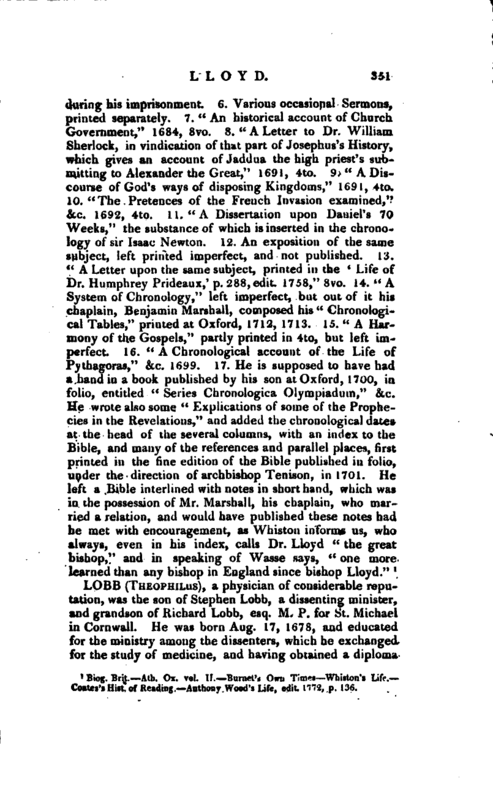 The world is likewise indebted to Lloyd for that stupendous work, Pool’s” Synopsis,“which was undertaken by his advice, as appears by a letter of that prelate addressed to Mr. Henry Dodwell, and communicated to Mr. Granger by his son, the late Dr. Dodwell, archdeacon of Berks. 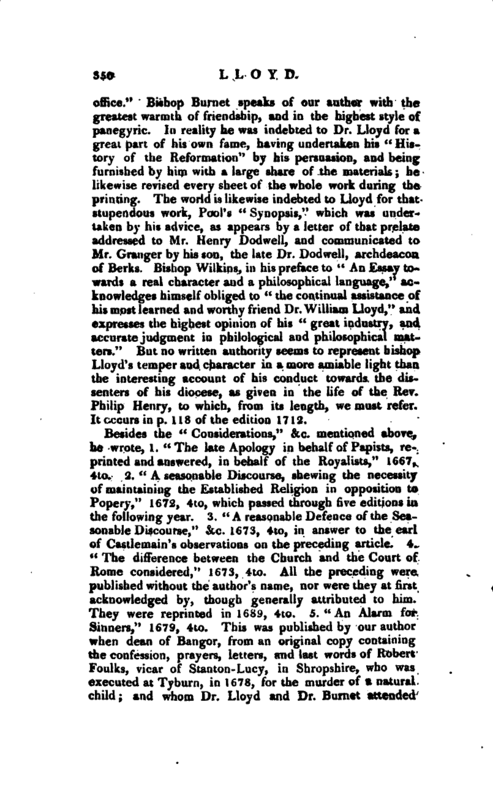 Bishop VVilkins, in his preface to” An Essay towards a real character and a philosophical language,“acknowledges himself obliged to” the continual assistance of his most learned and worthy friend Dr. William Lloyd,“and expresses the highest opinion of his” great industry, and accurate judgment in philological and philosophical matters." 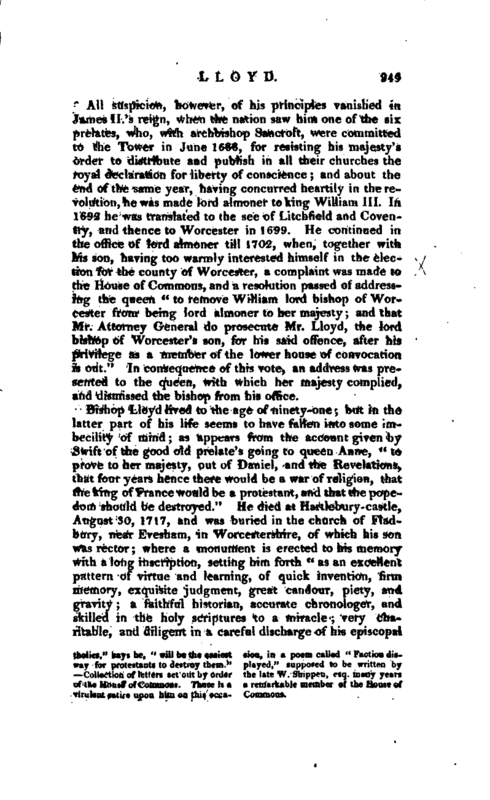 But no written authority seems to represent bishop Lloyd’s temper and character in a more amiable light than the interesting account of his conduct towards the dissenters of his diocese, as given in the life of the Rev. Philip Henry, to which, from its length, we must refer. It occurs in p. 118 of the edition 1712. Biog. Brit.—Ath. Ox. vol. II.—Burnet’s Own Times.—Whiston’s Life.— Coates’s Hist. of Reading.—Anthony Wood’s Life, edit, 1772, p, 136.